Johann Sebastian Bach (1685-1750) lived his whole life in Germany and in music. This video is his story, unfolded from the very places where his key life events took place. It is Bach for beginners, in the sense that young people who may never yet heard of him will find this journey through his life a fascinating adventure. At the same time, those who have long loved his music will be enthralled with the captivating details of his life and development. Born into a musical family, Bach's life was almost predetermined to be in the field of music. But from a child he internalized the art and passionately pursued the development of his skills. It would result in a legacy that has enriched the world and continues to inspire, engage, and touch souls across diverse cultural boundaries now close to three hundred years later. In this video journey we are accompanied by Bach authorities including classical guitarist Christopher Parkening. They guide us through the development, personal crises, challenges, remarkable work output, and the compelling inner motivation of Bach and show why it was so important to the composer that his gifts be used for the glory of God alone. He got his wish. Bach died in obscurity, his grave not even marked. 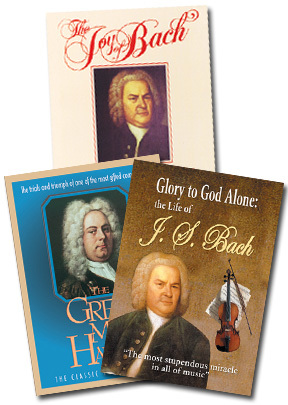 But God was glorified as Bach's music transcends the changing styles and passing centuries and infuses the world with a priceless treasure that will continue as long as music is embraced to transport us from the mundane. New 43 minute version includes some wonderful performances of J.S.Bach music as well as an interview with Mary Greer, President of the American Bach Society. "The most stupendous miracle in all of music." That is how one great German composer described Bach's work. His gifts were extraordinary. His life an adventure. His legacy priceless. A lavish period drama produced in 1942 by Lord Rank's G.H.W. Productions Ltd. This was the first color film shot with "character lighting" instead of the flat overall lighting hitherto demanded by Technicolor. This story deals with the later stages of Handel's life, leading up to the composing of his masterpiece "Messiah." During his early years in London, Handel had enjoyed the King's patronage and people flocked to the theatres to see his operas. But soon fashionable society turned against him. Plagued by financial worries and ill health and abandoned by almost everyone except those closest to him, Handel shut himself away and worked day and night on "Messiah." Its performance at the Royal Opera House in 1743 resulted in a standing ovation led by the King. It began a tradition and fitting honor for the incomparable Handel, composer of one of the finest oratories in the English Language. This delightful and kaleidoscopic presentation of the great composer's music includes an impressive assortment of period and contemporary performances given by a wide variety of celebrated musicians and interspersed with dramatic biographical sketches from Bach's life played by Brian Blessed of Masterpiece Theatre fame. Produced in 1988, this timeless presentation will be enjoyed by anyone with an appreciation for classical music.